What does it take to put on a sit down, linen-napkined, starched-damask-table-clothed, polished silvered, Norman Rockwellian-style, Thanksgiving dinner? The sort of dinner at which there are little acorn shaped chocolate hazelnut truffles at every place, where candles glow in polished silver candelabra, and heavy cream-colored place cards perch over every plate. Imagine cooking a dinner like that for twenty five people. Every year. For ten years. What if you followed that dinner with a similarly scaled Christmas dinner just one month later? Sounds totally crazy, right? Since we moved to Seattle nine years ago, I have never had to make Thanksgiving dinner, or Christmas dinner for that matter, thanks to my aunt, who lives just around the corner. Since I obviously like to cook, perhaps you are wondering why I don’t want to cook Thanksgiving dinner myself? I suppose, if anyone besides my very talented aunt were cooking, maybe I would have broken away from her big dinner and done my own. Sometimes I have thought about trying a sourdough, artichoke and prosciutto stuffing, or making brussels sprouts with chestnuts. But how could I? And miss her incredible menu and all the fun?! No way. It goes like this: On Thanksgiving night, as soon as I walk in the door, my uncle hands me a flute of champagne. In the background, one of my brother-in-law’s CDs plays just loudly enough to hear. Some cousins are clustered on low couches around the fire, which is blazing and snapping with big oak logs. On the coffee table, my dad’s sister has placed the Braunschweiger pate with aspic. Braunschweiger pate with aspic might be considered odd in this day and age and even a little lowbrow, but it is traditional in our family and beloved by those who knew our Great-Aunt Frances, who, years ago, always used to bring it. Weirdly, my kids adore it and I have to stop them devouring all of it so that somebody else can have a little taste. In the kitchen, more cousins play yatzy and cribbage games at the table, keeping my aunt company. She should be very busy with dinner. But my aunt looks as cool as a cucumber. Her kitchen is orderly and calm. How can this be? It’s as if, at the very last minute, she‘ll have to wave some magic foodie wand, and suddenly everything will appear on the buffet. Gleaming porcelain and glazed carrots. A wide platter of crisp little green beans with shallots or almonds. Deep pink sweet and sour cabbage. Hillocks of mashed potatoes with several lakes of melted butter glistening in the valleys. Clearly she’s been up to something. You have to actually roast a turkey if you want the house filled with that bronzy, burnished scent. It’s astonishing. How does her kitchen stay so clean? How come everything is done at exactly six thirty? There are mountains of deliciousness to account for! How does she do it?! I think I’m about to find out. This year, for the first time in a long time, most of us cousins have dispersed for the holiday. And so, my aunt is taking a break from Thanksgiving. I have decided it’s my turn to host a slightly smaller version of the holiday myself. Besides the five in my immediate family, my neighbors are coming to dinner. So are my aunt and uncle (who usually host), and cousin Steve. Hosting Thanksgiving for my aunt feels a little like hosting the queen of England (or maybe the Queen of Thanksgiving). This will take some planning. A lot of planning probably. I am aiming for a perfect Thanksgiving like my aunt’s, although in miniature, as my dining room seats just ten in a pinch. And why not? There is nothing intrinsically complicated about Thanksgiving dinner. What you need is a good plan of attack. Iron all the napkins (now is the time to make sure you have enough!) and the best tablecloth. Figure out the candle situation. Do you have any? Are they the right color? Do you want tapers, tea lights or pillars? All three? Have a non-alcoholic beverage for kids and those who don’t wish to imbibe. We have the obvious sparkling apple juice and bottled water. Buy the place cards and candy favors if you like that sort of thing. My kids would be crushed if I forgot. Figure out where you will serve the food – in my aunts house, the kitchen is so huge and she keeps it so tidy, she can serve from the enormous kitchen island. She displays the dessert on the buffet. I think my kitchen will be something of a disaster and I am clearing off the side board this afternoon. The kid art and clutter that typically inhabits that space will take off for the basement temporarily. a platter for the turkey – Mine won’t have to be too big as I will be carving in the kitchen and not at the table (I’m not good at carving and I don’t wish to have some sloppy turkey dismemberment in front of my whole family) Slices of turkey don’t take up as much room as the whole bird. Make the cornbread if you are serving cornbread dressing. You can freeze it then pull it out the day before Thanksgiving so it can dry out a little. Make and refrigerate a pie crust. See here for my favorite method. On the Tuesday before Thanksgiving, pick up the turkey and make the brine. I bought a brining bag but if you are going to use a huge stock pot, make sure that your fridge is big enough and that you have space. I know some people do this in a cooler with a lot of ice but that gives me the heebie-jeebies. I would probably have to throw the cooler away afterwards. On Wednesday set the table and do the flowers. Now let’s just see if I can stick to the schedule! I’ll keep you posted. Later today or maybe tomorrow, I will post a recipe for the cranberry shrub – I made some earlier this week and it’s wonderful. You can mix it with soda or ginger-ale for kids or with champagne or gin for grown-ups – fun! As you might have guessed I’ve given Christmas Dinner a lot of thought. There have been culinary highs and lows. I’ve made far too much, too rich food. I’ve lost a lot of sleep. I’ve allowed my kids too much Christmas chocolate and suffered some mind-bogglingly bad behavior. Two years ago I had to spend the afternoon on Christmas day in bed, trying to catch-up on rest I was too wired to get the night before. A lost cause. I’d drunk too much coffee! Figuring out how to have a nice day, a nice dinner and nicely behaved kids forces me to be reductive. I don’t want to spend the whole day in the kitchen. I want to play a board game, do a puzzle, get out of the house for some fresh air with the family and the dog. I want to make food that my kids will look forward to, that will thrill the grown-ups. If we want to be sure to have happy kids, this would not be the time for experimentation, even though my natural inclination is to try something new. Experimentation feels festive to me and I have to shelve that impulse. I have tried to create a tradition that isn’t bogged down by either trendy recipes that will quickly seem passé or uninspired renditions of the menus we had as kids. After much trial and error I’ve finally arrived at what feels like the perfect Christmas meal. It has been a long haul. One year I prepared a slavishly Swedish smörgåsbord with smoked fish, ham, meatballs, lingonberries and all the trimmings. The next year I made a totally traditional British meal with a haunch of roast beef, billowing Yorkshire pudding, crisply roast potatoes and gravy—followed by plum pudding. Cooking such complicated heavy meals takes weeks of prep and planning and it gets boring. This led to exhaustion (me), bad behavior (my kids) and frustration (Martin). Then I had an illuminating conversation with my aunt. The answer to my dinner conundrum turned out to be French dip sandwiches. Seriously. And no, they aren’t too pedestrian for the main event on Christmas Day. My aunt takes the French dip sandwich to a whole new level and yet she manages to keep the process easy so that her Christmas day is a relaxing one where she can enjoy her family and still have a meal that everyone looks forward to. She makes a standing rib roast for all of us on Christmas Eve and then, with leftovers, builds the most luxurious French dips the next day. I can do this! I thought. So now I roast a beef tenderloin, which is a very easy thing to do on Christmas Eve, and slice it up the next day. I stir a little horseradish into some creme fraîche so it’s got a searing edge to it. I open a jar of cherry chutney that I buy at the store—that’s easy. I put par baked little French breads from La Brea into the oven; they are perfect with a crispy crust and an interior with just enough oomph that it doesn’t melt into the brothy dip. (Once I tried brioche rolls – a disaster! They disintegrated.) I butter the bread and layer it with piles of thinly sliced rosy beef. Wrapping the sandwiches in foil, I put them in the oven to make sure they get good and hot and move on to the salad. The beef broth for dipping is made the weekend before, and heated up just before serving. With the sandwiches there will be a salad, a variation on the one that I made a few weeks ago, the failed salad. I’ve tweaked the recipe and now it works. The watercress gets a much milder blue cheese, blood oranges and candied walnuts. I kept the pickled currants and shallots and added juice from the blood orange to the vinaigrette. Now the salad is perfectly balanced. The colors are vibrant and very Christmas-y. For starters we have smoked salmon on homemade Swedish rye bread with all the trimmings: minced red onion or chives, lemon, unsalted cultured butter, sea salt. With this you must serve champagne. The one thing I couldn’t ditch was the plum pudding. And I’m going to tell you how to make it, even though I would put money on the fact that nobody who reads this will actually try making one. My grandfather faxed the recipe to me from England, transcribed from my grandmother’s “norse mutterings”, back in 1991. It really wouldn’t be Christmas dinner if I didn’t serve Granny’s Plum Pudding afterwards. You can make this weeks in advance of Christmas. It will only improve with age. 3/4 cup sherry—or “any booze you have”; some people like Guinness for this. Others, ginger beer. Stir all the ingredients together until well combined. Pack into a buttered pudding basin and steam in a soup pot for 6 hours. You do this by sealing the pudding basin and placing on a stainless steel vegetable steamer. Fill the pot with water so that it comes a quarter way up the sides of the pudding basin. After six hours let it rest uncovered on the counter until it is cool. Store in the refrigerator for weeks if necessary and reheat in a steamer on the stove. This seems to take about 2 hours. All this cooking will not hurt the pudding in any way. Martin says that Plum Pudding is really just a vehicle for the following hard sauce and I understand what he is saying up to a point. In my opinion, you do need to serve Plum Pudding with some sort of sauce. We like Hard Sauce. Some people serve it with a sickly rum creme anglaise kind of thing but I don’t approve of that. Cream the butter and then add the sugar. A hand mixer or food processor will make this very quick. Then add the brandy and process until smooth. Taste it; you may want more brandy. Put the hard sauce in the refrigerator to chill. I like this lethally strong as the contrast of the boozy sauce melting over the the mindbendingly rich and steamy pudding is so completely diverting. It would be very much in the spirit of the Christmas season to have a not-too-small piece heated up in the microwave the morning after with a spoonful of Hard Sauce. Eat it in bed before the kids have woken up with a cup of strong Indian tea with milk on the bedside table, while reading one of the books you unwrapped the day before. I first had these slow roasted tomatoes at Vios, the Greek restaurant around the corner from my house. It’s just the right kind of neighborhood restaurant – with couples, old people, teenagers and families all mixed up. The owner is Greek, his eyes twinkle when he talks and he often sits down to chat at your table. He makes this chicken souvlaki plate that I just love so I had to try to make all the parts at home. Nestled on a small oval plate are little skewers of chicken flecked with thyme, the creamiest tzatziki shot with green olive oil, warm triangles of pita (crisp on the outside, moist on the inside! ), a tangle of flat-leaf parsley leaves and thin ribbons of red onion dressed in olive oil. You take all the parts and combine them as you wish – my favorite kind of eating. The best part though, and the part I had the most difficult time figuring out, are the slow roasted tomatoes. The tomatoes are key. I had this idea of eating under the grape vine trellis in my back yard surrounded by big platters of grilled chicken, salads, hummus and tzatziki, in the heat of a warm summer night: my very own home a Greek taverna! Most of the pieces of the menu are so easy but those darn tomatoes had me stumped. I couldn’t figure out how to match their melting caramelized savory-sweetness. I actually called the restaurant to see if they would give me the recipe. The person I spoke to was polite and friendly but rather vague, some might say cagey. She said, “Well, you just cut the tomatoes up, put a tiny bit of sugar on them, a pinch of salt and cook them for a really long time in a low oven.” Hmmm. “How low? !” I asked. “Uhhh, well, I really couldn’t say. A low oven. For a long time.” She laughed. “How much sugar? !” I whined. She laughed again but wouldn’t tell me anything else. I was on my own. After several tries I am happy to say I think I’ve nailed it. I made them last week with the last tomatoes from the garden. We had these dense paste tomatoes hanging from the vines and they were just right for the job. Big heirloom tomatoes are too juicy for this recipe. The cool thing is that even those dreadful wintertime Roma tomatoes actually work pretty well slow roasted. So even if summer is long gone and there is no chance at all of recreating your very own Greek taverna in the backyard, you can still pretend in your dining room. That’s what I do. Cut the tomatoes in half lengthwise and using a teaspoon or your smallest finger, push the seeds out and discard them. In a large bowl toss the tomatoes with the salt, sugar and thyme. On a large rimmed sheet pan arrange the tomatoes cut side up. Bake until they are somewhat shriveled and browned at the edges – this could take 2-3 hours. Be sure to save all the juices from the pan to drip over the tomatoes and keep them moist. There are many ways to serve these slow roasted tomatoes if you aren’t up for a massive Greek feast. Try them tossed with hot pasta and goat cheese and some torn basil leaves. Slip them into a sandwich like this one. Or if you’re flagging in the late afternoon, pull a few out of the refrigerator and eat them with more goat cheese on rye crisp crackers. You’ll be happy you did. I’m not going to sit here and pretend that making this tart is a snap or anything. It’s not. Pate Sucrée is a pain and I’m never sure if I’ve got it right. That being said, even when the pastry comes out funny looking, it never seems to make a difference – the custard holds everything together beautifully. 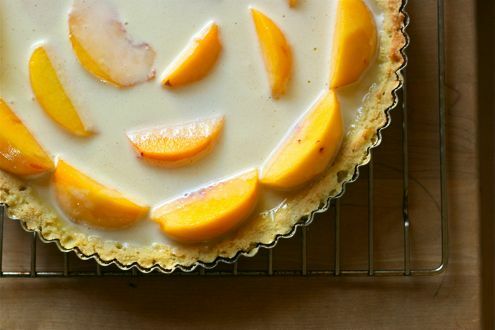 And to miss out on this Peach Tart at the height of the peach season in a state known for their “Holy Sh-t” peaches, well, that would just be wrong. So pull up your socks and get to work. This one is absolutely worth it. 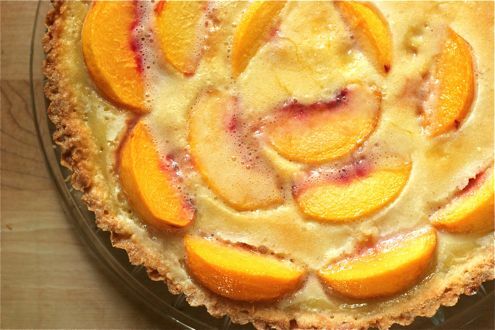 In this tart, the peaches crisp up under a delicate cloak of sugar and underneath are smooth and sweetly-tart. If you make the tart the day you plan to eat it (you must – this is not a dessert to make ahead of time) the custard will be so softly, almost breathtakingly set, and still you’ll be able to make beautiful neat slices. The creamy filling is on the verge of cascading over the crisp crust, just barely holding together, voluptuous and satiny. I scented the custard with St. Germaine, that elderflower liqueur I’m always going on about. The elderflower only enhanced the perfume of the peach, there was no alcoholic tang – nothing aggressive or distracting. This tart shouldn’t have a grown-up edge. The peach is the star here and the ripe fruit flavor sings. Last summer, I made a version with nectarines which I thought at the time was the pinnacle of all summer stone fruit desserts- I would never have believed there was a better way. And now this. Sigh. The world is a beautiful place. Full of surprises. I have to credit In the Sweet Kitchen by Regan Daley for this recipe – and SO many others. A truly excellent dessert resource. I never use anything else. Definitely this book is in my top three favorite cookbooks. And that includes all of them. Not just dessert! 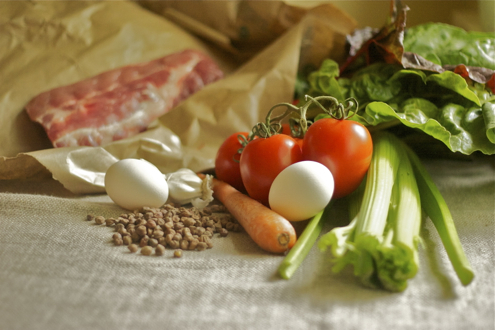 Get all the ingredients measured out and in the freezer before you begin. You might even put the tart pan in there too. In the food processor, whirl the flour, salt and confectioners’ sugar for a few seconds with the steel blade. Toss the cold butter evenly over the top and pulse until the largest pieces of butter are about a 1/4″. Don’t over process. Dump the dough into the tart pan and with lightly floured fingers press the dough evenly across the bottom and up the sides of the pan. You will have extra dough. The top of the dough ought to line up with the top edge of the pan and it should be no less than 1/4″ thick. The dough will shrink slightly as it bakes. 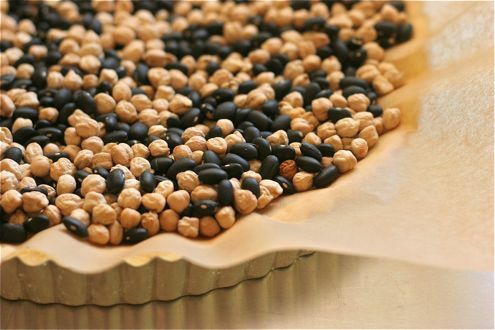 Wrap the tart pan in plastic wrap and freeze for an hour, or let it rest in the refrigerator for 3-24 hours. Do not skip this crucial step. The dough needs to be chilled and well rested before it goes in the oven. Prick the bottom of the tart shell about 20 times with the tines of a fork. I press my fingers against the dough when I pull the fork out or it crumbles. Line the bottom of the tart pan with parchment. Unintentionally, I bought silicone coated parchment last time, and I am glad. You can use regular old parchment or foil, but there is a danger of it sticking to the pastry when you remove it part way through the baking process. Top the parchment or foil with pie weights if you have them or do what I do: keep a stash of dried beans for the purpose. Bake for 15-20 minutes or until the edges of the pastry are becoming golden and the pastry bottom is looking cooked and a little dry. Carefully remove the parchment or foil and weights, and bake for another 10 minutes, until lightly browned all over. Set the oven to 325. Cool tart pastry on a rack for 15 minutes. Brush the tart with the reserved beaten egg white and bake for 3-5 minutes – just until the pastry looks dry. Wash and dry the peaches and peel them with a swivel vegetable peeler – the serrated ones for soft fruits work very very well! Halve the peaches by cutting all the way around, using the little natural seam as your guide. Gently twist the two sides to pull them apart and remove the stone in the center. Cut each half into 8 wedges. Arrange the sliced fruit in concentric circles around the tart crust, starting at the outer edge. Be prudent and don’t over fill. Leave room for the custard! Set tart pan on a rimmed cookie sheet. This will make it easier to put into the oven without spilling. Whisk the egg yolks in a small bowl. Slowly add the 1/2 cup of sugar, whisking as you go. Sift the flour over the eggs and sugar, and whisk again until very smooth. Add the cream and whisk some more – as you can see, smoothness is the idea here. Stir in the vanilla and St. Germaine or whatever flavoring you have chosen. Pour the custard over the peaches in the tart shell. Sprinkle evenly with the 2 tbsp of sugar. Bake the tart for 35-45 minutes, or until the custard in the middle is barely set – test by lightly touching the center with your finger. Place the tart pan on a wire rack on the counter until cool – at least 2 1/2 hours. Don’t count on having any leftovers for breakfast. You’re sure to be disappointed! This Peach Tart was so delicious, I was sort of devastated when it was gone so quickly. Then I thought about it for a minute. I will just make another next weekend. Life, and peach season, is too short not to. It’s summer (sort of) here in the Pacific Northwest. I’m going to keep this quick and offer Gravad Lax – home cured salmon – as an option for when you are tired of the grill. For me this happens maybe once each summer – usually during a heat wave when it’s too hot to stand around flipping burgers in front of a red-hot pile of charcoal. Instead of singeing your eyebrows off in 90 degree heat by the Weber while your guests are sitting over there drinking cold beer, your dinner is already done, so you can be sitting in the sun with a beer too. You see, you salt the fish two days before you eat it, allowing it to cure in the refrigerator. About half an hour before you want to eat, pull the salmon from the cold of the fridge and shave the thinnest translucent slices possible from the fish. The salt will have pulled all the moisture out and the color will be vividly red. The cool salty-silky salmon is a welcome change from peppery charred filets you might expect on a hot June night. Even though it’s not exactly hot here in Seattle. I like to imagine serving gravad lax in the long bright evenings you get in Stockholm at midsummer, but without the mosquitoes. We didn’t have mosquitoes last week but since this is Seattle in June, we had rain, rain, rain. No sultry summer evening in the garden for us! Still, we had a fantastic time with friends. With the salmon, we served rhubarb cocktails. I’m including both recipes. Happy summer! Toss all ingredients together in a small baking dish (for instance, an 8″x8″ square pan or a gratin). Cover tightly with aluminum foil. Bake in the oven for about 1/2 an hour until the fruit is completely soft. Refrigerate until cold and proceed. In a tall cold champagne flute stir together the aquavit, cointreau, rhubarb puree and the bitters. Top up with chilly Prosecco and float a wide piece of orange peel to finish. This is now my favorite summer cocktail. That St. Germaine that I sometimes rave about would potentially be an excellent substitute for the Cointreau if you happen to have any lying around. Allow 4 days to complete the recipe. Note that there is a total of 15 minutes easy work though. Day 1-2: Freeze the salmon for 48 hours to kill any parasites. Day 3: First, cut the salmon fillet in half across the short dimension. If you pull any pin bones with needle nosed pliers, you will make slicing and serving a lot easier. Stir the peppercorns, salt and sugar together in a small bowl. In a rimmed baking dish (to catch any salt that doesn’t adhere) rub about a third of the salt mixture on the flesh side of each piece of salmon. Sandwich the salted fish, flesh sides together, with the rest of the salt mixture and the dill in the middle. The thick part of one piece should top the thin part of the other. Place in a gallon-sized Ziploc bag, carefully sealed, in the bottom of the refrigerator for 2 days. I would put the bag in a baking dish. Turn the bag a couple of times a day. Gravad lax keeps for at least a week, drained of all the accumulated liquid, in the refrigerator. Well wrapped, it keeps for 3 months in the freezer. Serve with crème fraiche, chopped chives or minced red onion, lemon wedges, maybe a few cucumber slices and if you are feeling ambitious (I recommend this) some excellent homemade rye bread with fennel seeds. (If you haven’t tried rye without caraway seeds, you haven’t lived. You won’t be disappointed I promise – send me a comment if you want the recipe!) Otherwise some of those rye cocktail squares or German style pumpernickel would be fine. I like to make a big platter with everything, piling up the gravad lax and all the condiments in heaps. Little teaspoons can scoop up the crème fraiche and onions. Everyone can build little sandwiches according to their own taste. A little bite of sandwich, a taste of the cocktail, and around it goes. What a nice party! A more organized person than I am would at least provide cocktail napkins. Oh well. Consider that for years I have scrupulously avoided all dark mineraly leafy greens. Chard, spinach, escarole, kale. So bitter and chewy – not what I was after in a vegetable. So no one could be more surprised than I that my current obsession is with lacinato kale. Dinosaur Kale. Black Kale. The blackest, most tooth-y leafy green of them all. I’m still not quite sure how it happened. And of course kale’s healthy. In fact, as far as I can tell, it’s the healthiest thing at the grocery store. It gets a 1,000 point ANDI* score, right up there with mustard, turnip, collard greens and watercress, making it almost 30% more healthy than even spinach! Why the fixation on kale? The strange dark chewiness – intriguing! I have a girlfriend who is so into lacinato kale that she eats it raw. But first she has to massage the kale. She said it was part of being macrobiotic or something. Massage. Kale. Really?! I should be on the receiving end of any massage, not mere kale. Anyway I don’t eat it raw. No. I like kale blanched then sauteed with little rings of shallots and ribbons of prosciutto. Tossed with sherry vinegar and a knob of butter. Or in white bean soup. And make that cannellini beans not navy beans. For me, white bean and kale soup is the pinnacle of all soups. 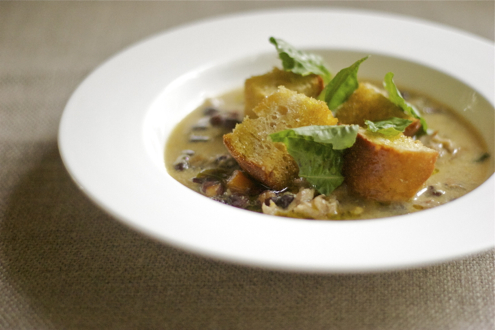 I have been working on variations of this soup for over a year and I think I am nearly there. White bean and kale soup might be a strange thing to crave on a desert island, I know, but for me this is the best kind of food: flavorful, nourishing, and more-ish. So today, I am going to start a two-part article on my desert island food which, shockingly, turns out to be White Bean and Kale Soup with Fennel. 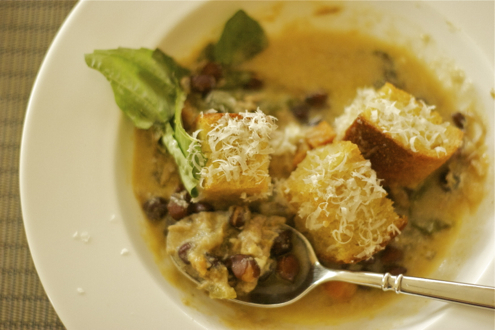 The creamy beans, the blackish intensity of the kale, the delicate, particular perfume of fennel. Not to mention the chicken broth holding the whole thing together. Store-bought stock will not cut it in this recipe. I don’t want you to try this with Pacific Organic Chicken Broth or anything else from the soup section at your grocery store. The full experience starts with a deeply flavorful but light-handed, deftly salted broth. If you start with stock from a box, I can’t be responsible for your impression of my favorite soup! You will think I’m a nutcase if you start with industrial broth. (You probably think I am a nutcase anyway!) We have to start from the beginning. Chicken bones, water, salt and pepper, carrots, celery, etc. And go from there. This is how I do it. Part One. People like Ina Garten start their stock from whole chickens. In Ms. Garten’s case, from 3 whole chickens. I have tried this with 2 whole chickens (my pot, while huge, is not that huge) and it is very nice, but it costs $28 just to buy the birds. Stock should be about thriftiness, though not mean frugality. The components should be fresh and plentiful, but whole chickens?! Not here. Save them for roasting and do as I do. Fresh backs and necks with maybe a leftover roast leg or thigh for richness. Don’t freak out about the length of the recipe. This is fifteen minutes of hands on work. Fifteen minutes! You can handle it. Toss the raw chicken backs and necks in a wide roasting pan, giving the bones plenty of space with 2-3 tablespoons of olive oil and 1 heaping tsp of sea salt and some freshly ground black pepper. Roast for 4o minutes, until deeply browned and very fragrant. Put the bones in the bottom of your soup pot. I used to use an enormous stainless steel pot, but it was so unwieldy and the process became too much of a production. Now, I use an 8 quart Le Creuset stock pot that I think of as medium sized and make enough stock for 2-3 pots of soup. I use 8 cups of stock for the soup and freeze the leftovers. Once the bones are in the soup pot, the roasting pan will be a sea of chicken fat and olive oil, pour all of it off and dispose of it properly (not down the drain!). Then take about 1/2 cup of water and scrape up all the brown flavorful bits off the bottom. Do this while the pan is still hot! Be thorough – there is a lot of flavor there. Pour all of the browned pieces and now very flavorful water into the stock pot as well. Add any leftover roasted bones from a roasting chicken now, or any leftover cooked chicken on the bone if you have it. Place the carrots, celery, onions, garlic, bay, peppercorns and parsley into the pot. You can tie the parsley to the side, or not. I like to fish the parsley out at the end as it is kind of slimy and soggy – even though I strain the stock anyway. Add water until it completely covers the chicken and vegetables and is dangerously close to overflowing. Heat the water over high heat until just about to boil. Then lower the heat and simmer very, very gently (barely bubbling) for 3-4 hours. Skim off any scum that forms on the top. When the level of the soup has dropped about an inch and your house is redolent with the the warm scent of chicken broth, it is time to taste. Be thoughtful – you haven’t added sea salt yet. You have to think carefully about what you are tasting. And you have to choose, salt the broth now or salt the soup later? I usually salt the soup later – at the beginning when I am cooking the onions, carrots and celery. If you can’t wait that long to start to see that it is perfect already, add one teaspoon of sea salt (I love Redmond Salt from Utah), taste and then add very small increments until your stock tastes lightly salted and totally delicious. Now it is time to strain off all the vegetables and chicken and bones which will be sapped of anything worthwhile and need to be thrown away. Line a colander with 3 layers of paper towels and ladle the broth through them into a large bowl. You will probably need at least two large bowls. Then, if you are making soup the next day, ladle 8 cups into a storage container that fits into your refrigerator. Ladle the rest into Ziplock bags in either 4 or 8 cup increments and freeze, labelled and with the date. I do this every 3 weeks and now I have a huge stockpile of…errr, stock! P.S. Ok…after some thought – who am I kidding?! Kale and White Bean Soup may be my desert island food right now – but how long will this obsession really last!?!?! When I change my mind, I’ll let you know.